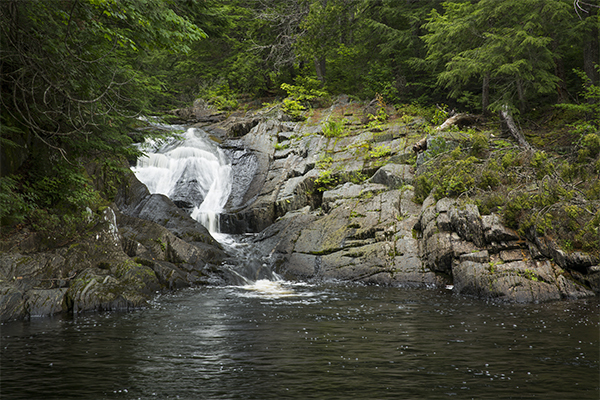 The 18-foot tall lower falls of Little Wilson Falls offers a great pool for swimming and wading. This is one of the most popular places where the locals go on a warm summer day. Between the scenic waterfall and the fun swimming holes, visitors of all age groups are often seen here. 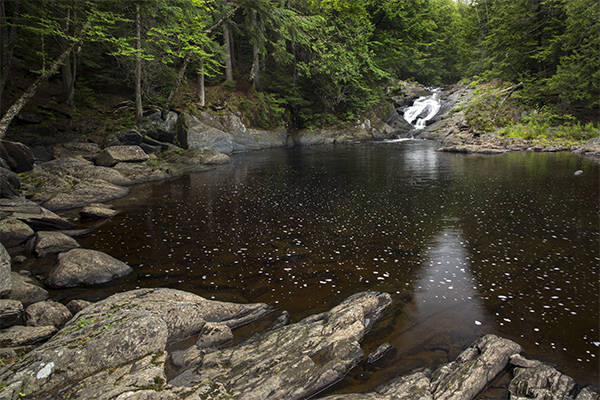 Although camping near these falls was a long-cherished activity, fires are no longer permitted here. While these falls are impressive in their own right, the stunning beauty of the 40-foot upper falls is undeniable. Hiking to the upper falls from the lower falls is 2.8 miles round-trip and is rated moderate. The lower falls can be seen through the trees from the parking area since they sit only 200 feet away. A nearly level path leads closer to the falls. 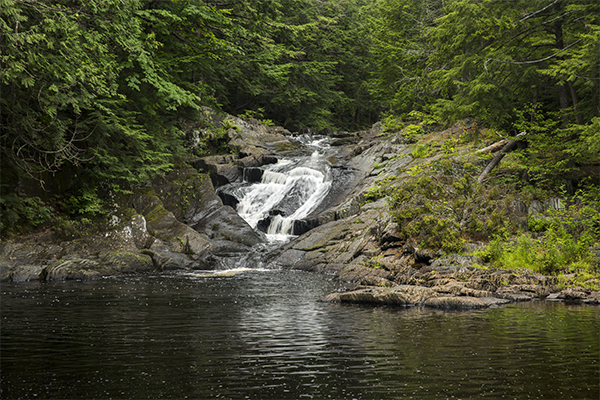 A smaller set of falls with good swimming holes, sometimes collectively referred to as the Middle Falls, is 0.35 mile upstream of the lower falls. A blue-blazed trail to the left of the lower falls provides access to the middle falls. From the post office building in downtown Monson, take the combined highway ME 15 north and ME 6 west for 0.5 mile and turn right onto Elliotsville Rd, which ultimately leads to the Borestone Mountain Audubon Sanctuary. Follow Elliotsville Rd northeast for 7.6 miles and take a left onto a narrow, rough, and sometimes muddy dirt road that enters a nature preserve within the Elliotsville Plantation. This dirt road, which is normally fine for most SUVs and trucks but may not be suitable for other passenger vehicles, is just before a bridge over Big Wilson Stream. This road is also directly across from the parking pull-off on Elliotsville Rd that is used to visit Big Wilson Falls. If you are unwilling or unable to drive your vehicle down this rough road, drive 100 feet along the road and park in a pull-off on the left. It is an easy and nearly flat 0.7 mile walk to the trailhead from there. Otherwise, drive 0.4 mile along this road and you will reach a fork. Fork left and drive 0.3 mile further to a large parking area at the end of the road. If, upon reaching this fork, you determine that you have had enough of driving on this rough road, there is plenty of space to park so that you can walk the final and easy 0.3 mile to the official trailhead. 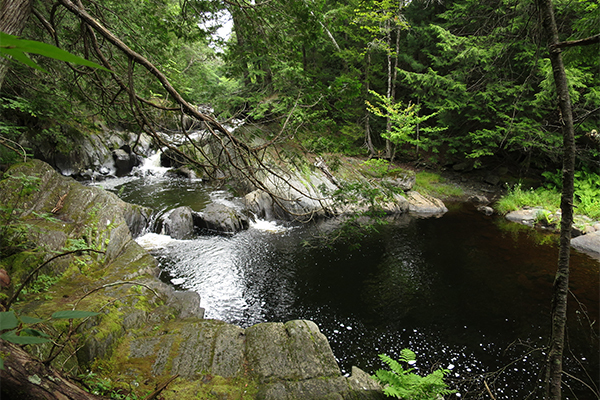 The official trailhead is used to access the middle, lower, and upper falls on Little Wilson Stream. To get to Monson, take ME 16 east from Bingham and turn left onto the combined highway ME 15 north and ME 6 west in Abbott. You can also reach Monson by taking ME 15 north from Bangor or Dover-Foxcroft. The trailheads for the lower falls is also used to hike to the famous upper falls along the Appalachian Trail.